Rhubha Mhic Ghille-mhaoil, Ardminish, Argyll & Bute, Scotland. Carse Standing Stones East, Loch Stornoway, Argyll & Bute, Scotland. Lichen at Uamh Niall cave, Ardminish, Argyll & Bute, Scotland. Carse Standing Stones West, Loch Stornoway, Argyll & Bute, Scotland. Isle of Gigha from Port Mor, Argyll & Bute, Scotland. Passing Place, Port Mor, Argyll & Bute, Scotland. Islay in mist from Port Mor, Argyll & Bute, Scotland. Eilean Mor in the Sound of Jura, Argyll & Bute, Scotland. Keyhole, Kilberry, Argyll & Bute, Scotland. The Sound of Jura, Argyll & Bute, Scotland. Ormsary, Argyll & Bute, Scotland. I always hope a remote building marked on the map will prove to be some kind of shelter to get out of the wind. This doesn’t always prove to be the case. Camp, Ormsary, Argyll & Bute, Scotland. Stunningly beautiful photos as always. And I could watch hours of video like that! 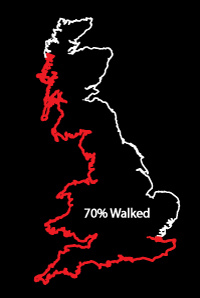 It’s like walking though that extraordinary terrain, without the obviously extraordinary effort. Glorious, and incredibly restful (I’m sorry to say). Thanks for taking such heroic efforts and bestowing them so generously on us feeble stay-at-homes. Thank you and fascinating to me the video is restful for you. I can’t remove the feeling of toil behind it! Of course you can’t, (why I said sorry) I realise it must sound weird. I think it’s the rythymn of your walking – I can get the feeling of really being there moving through the landscape with all the pleasant sensations but without the physical struggle. It surprised me too but it’s really delightful. Much better than drone footage. More of the same, please! (though obviously not wishing such rough going for you too often). Such views! Never gets old! Happy hiking! Indeed, always new surprises. Thanks!